RAISE UR PAW NEWS: #BITEBACK CAMPAIGN COMMENCES SOON! SEPTEMBER 28th - 30th, 2015 is #BITEBACK days! 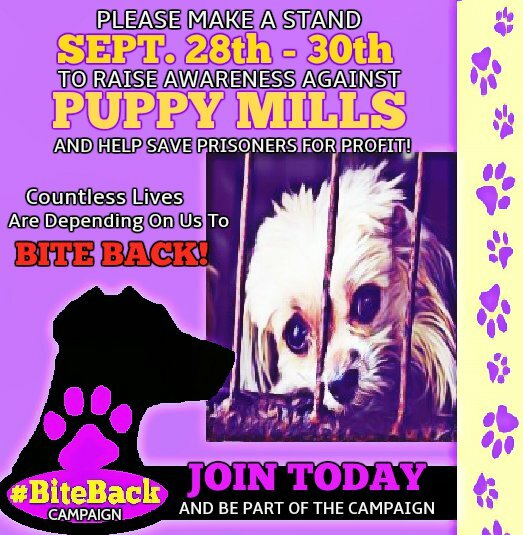 A CAMPAIGN TO BITE BACK AGAINST PUPPY MILLS WORLDWIDE. Our #BITEBACK campaign was established in uniting individuals around the world to bring global awareness about the issues of puppy mills, in hopes of bringing these companies of cruelty to an end and save the countless lives of prisoners for profit. We are asking that everyone take a moment of their time, even if it is for a second to wear something PURPLE, (representing the bruises & suffering that prisoners for profit are subjected to and endure on a daily basis in order to fulfill the needs of greed and selfishness) and use the hashtag #BITEBACK. Although this is our first year with this campaign and movement, Raise Ur Paw is hopeful that many individuals, organizations, celebrities & animal angels worldwide will unite as one empowering and inspirational voice for the innocent prisoners of profit in desperate need of saving, and to raise those voices high in bringing forth an end to these cruelty mills. So many innocent beings will continuously be victim & endure a lifestyle that contains residing within unsanitary conditions among filth & waste, be uncared for without any veterinary care, continuously bred for mere profit, some even suffering from diseases, illnesses etc, and these fragile souls NEED US TODAY! The Stand We Make Today.. Is the Difference We See Tomorrow! PLEASE RAISE UR PAW & JOIN THE CAMPAIGN & MOVEMENT!